What can KIDFamMap do for you? KIDFamMap is the first database grouping 189,987 kinase-inhibitor interactions (from BindingDB and kinase profiling) into 1,210 pharma-interfaces (called kinase-inhibitor family), deriving the relationship between the moiety preferences and physico-chemical properties of binding sites of kinases and inhibitors, relationships between 399 human protein kinase (from Kinase.Com), 35,788 kinase inhibitors (from BindingDB and kinase profiling) and 339 diseases (from OMIM and KEGG). KIDFamMap groups kinase-inhibitor interactions into different families based on their pharma-interfaces. For each family, KIDFamMap shows the pharma-interface and interaction between kinase and selected inhibitor. 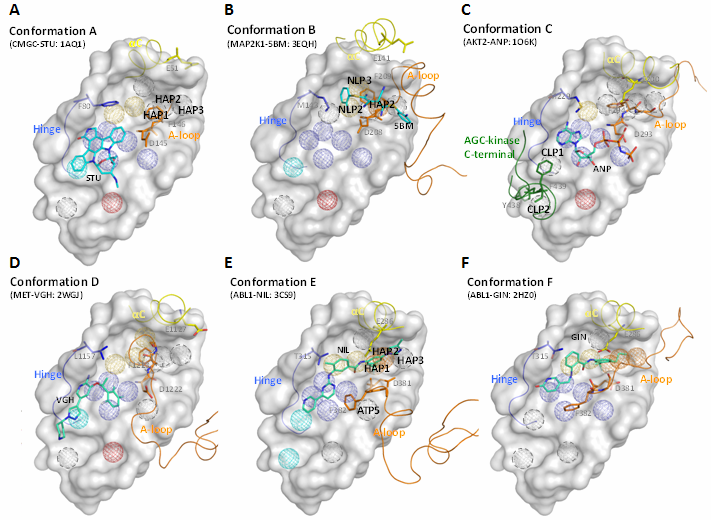 KIDFamMap identifies moiety preferences and physico-chemical properties of binding sites of selected kinase, anchors and inhibitor-anchor map. Users could query kinase Gene Name in the query kinase interface. If no exact match records in database, KIDFamMap user input as keyword to search database and return the possible kinases. Users also use kinase sequence of FASTA format as query. KIDFamMap would search 518 human protein kinase by BLAST and return possible kinases. If users have no idea about kianse Gene Name or sequnces. KIDFamMap provides query kinases by different kinase groups or by alphabet of kinases. In addition, all protein kinases is listed in the browsing page. Users could query compound name in the query compound interface. If no exact match records in database, KIDFamMap user input as keyword to search database and return the possible compounds. KIDFamMap provides users to upload MOL file of the query compound. Server would compare the compound topology similarity with 37,355 compounds recorded in KIDFamMap and return the top100 similar compounds. Users could query disease name in the query interface. KIDFamMap also provide user to query disease by alphabet of diseases and additional all diseases link page. Each query sequences is in FASTA format consists of a single-line description, followed by lines of sequence data. The first character of the description line is a ">" symbol in the first column. KIDFamMap utilitizs published SiMMap server statistically derives site-moiety map with anchors, which describe the relationship between the moiety preferences and physico-chemical properties of the binding sites of kinase-inhibitor comeplexes. The superimposed SiMMap anchors of these kinases can be roughly clustered into 14 groups, called KIDFamMap anchors, based on space distances and domain knowledge. 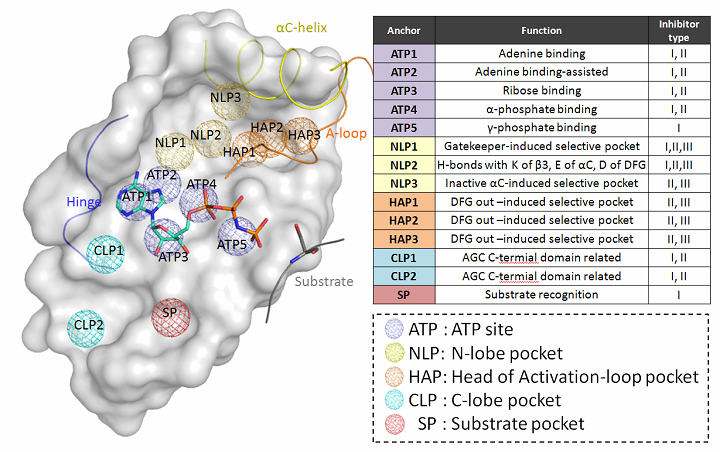 According to the conformations and functions of kinases, these 14 KIDFamMap anchors were divided into five pockets, including ATP site (anchors ATP1-5), N-lobe pocket (anchors NLP1-3), head of A-loop pocket (anchors HAP1-3), C-lobe pocket (anchors CLP1-2) and substrate pocket (anchor SP). Protein kinases are one of the most important classes of drug targets because the deregulation of kinase functions is often implicated in many diseases such as cancers, neurological and metabolic diseases. These kinase related diseases are collected from OMIM and KEGG. KIDFamMap provides 962 kinase-inhibitor-disease relationships and 339 diseases. The allelic variants are collected from OMIM. There are 638 disease allelic variants in KIDFamMap. Most of the allelic variants represent disease-causing mutations. A few polymorphisms are included, many of which show a positive correlation with particular common disorders. For each identified anchors in the kinase-inhibitor familes, KIDFamMap provides the conservations of identified anchors with Weblogo. These pocket patterns presents the sequence conservations of surroundings of interacting residues. The result will be shown as data tables and visualized in 3D presentation. Jmol applet is embedded for 3D presentation. We suggest users' browser to install Java Runtime Environment for running Jmol applet. We present compound structures by using OASA library which is a python library for manipulation of chemical formats that forms the base of BKChem. OASA library of BKChem is a free chemical drawing program. It was conceived and written by Beda Kosata. In some cases, the figures cannot be correctly generated (ex: bulky circles or closed substitution groups). These problems will not interfere with our analysis. National Chiao-Tung University, Hsinchu, Taiwan, R.O.C.